Michael Behrmann and his mother, Cindi. On May 11, 2017, negligence stole the vibrant life of 58-year-old Cindi Behrmann. The grandmother of two young boys fell from a wheelchair lift shortly after arriving to her doctor’s office in Conyers for her appointment. 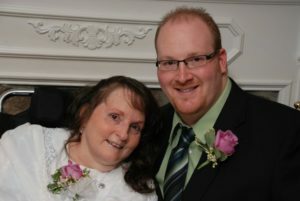 Mrs. Behrmann battled Multiple Sclerosis for 30 years. At the time of her incident, she had lost the use of her hands, arms, and legs. Her head struck the concrete below without anyway of bracing for the sudden drop. After the fall, Mrs. Behrmann broke both of her femurs, broke her nose, and suffered multiple injuries to her head. She immediately complained of being in pain and she was life-flighted from Rockdale Medical Center to Atlanta Medical Center where Mrs. Behrmann lost consciousness. Her eldest son, Michael Behrmann, received the tragic phone call about his mother later that evening at his Florida home. “Mom was in a horrible accident,” said Behrmann’s younger brother. However, the family was still under the impression that Mrs. Behrmann would survive. She was scheduled to have surgery to repair her broken femurs the following morning but Mrs. Behrmann never made it through the night. “At three in the morning, my father called to tell me that my mother passed,” said Behrmann. “If I had the opportunity to have my mom back, I would want my mom back.” Three days after Mrs. Behrmann’s death, a friend of the family suggested that the Behrmanns seek the services of the Haug Law Group.